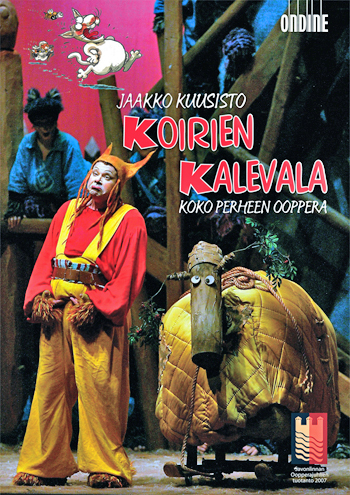 This DVD Video features the one-act family opera Koirien Kalevala ("The Canine Kalevala") by Finnish composer-conductor Jaakko Kuusisto. The libretto by Sami Parkkinen is based on the same named book by Mauri Kunnas (official website) who in 1992 wrote an adaptation for children of the Finnish national epic Kalevala. Mauri Kunnas's children's books have been translated into 23 languages with over 5,5 million copies sold. Jaakko Kuusisto: "Koirien Kalevala is probably one of the most popular Finnish children's books of all time, and with good reason. The wonderful insight of Mauri Kunnas in linking the Finnish national epic to his lovable dog characters appeals not only to children but to their parents too. And this is not the Kalevala, um, gone to the dogs - instead, the story is exactly like in the original, put across in an easily understandable way. Sami Parkkinen fashioned an opera libretto out of the version by Kunnas, keeping all the essential elements. The sets and costumes of the production featured on this disc also draw heavily on the visual world of Kunnas, and as such look very familiar to anyone who has ever read the book." This DVD recording was made from live performances in July 2007 at the Savonlinna Opera Festival, where The Canine Kalevala had been premièred three years earlier to critical acclaim. Jaakko Kuusisto conducts a cast of known Finnish actors and singers. The production is staged by Minna Vainikainen and designed by Tarja Väätänen (sets), Riitta Röpelinen (costumes) and Max Wikström (lighting). This DVD release was made in co-production with the Savonlinna Opera Festival. It includes full English subtitles and booklet notes in English and Finnish.